A giant dust storm that now covers nearly the entire southern hemisphere of Mars could permanently jeopardize the future of the Mars Exploration Rovers mission, officials told SPACE.com today. The new and potentially bleak outlook is a stark shift from the prognosis earlier this week. Further compounding the threat to the rovers, a second large dust storm has recently appeared on the Red Planet. The first and largest dusty squall has reduced directsunlight to Mars? surface by nearly 99 percent, an unprecedented threat forthe solar-powered rovers. If the storm keeps up and thickens witheven more dust, officials fear the rovers? batteries may empty and silence therobotic explorers forever. ?This is a scary storm,? said Mark Lemmon, aplanetary scientist at Texas A&M University and member of the rover team. ?Ifit gets any worse, we?ll enter into some uncharted territory. There?s been alot of discussion about what we?re going to do if (the rovers) don?t haveenough power to run during the day.? The storm, firstreported by SPACE.com, hasn?t yet reached global proportions, but thedust levels are the thickest the rovers have ever experienced. Lemmon said theconditions rival Mars? globalstorm of 2001 and another in 1971. ?This thing has been breaking records the pastfew days. The sun is 100 times fainter than normal,? he said. ?We?re hoping fora big break in the storm soon, but that?s just a hope.? In exactly two weeks, the larger dust storm ballooned from 230,000 square miles (600,000 square km) to its present size at nearly 7 million square miles (18 million square km), said Michael Malin of Malin Space Science Systems in e-mail interview. In just a few days, however, its smaller counterpart has emerged as a 3-million-square-mile (7.7-million-square-km) dust bowl. Together, they cover an area larger than the United States, Canada and Greenland combined. "These large dust events are not a single storm, but are actually made up of a number of local and regional-size dust storms," Malin said. By kicking up enormous amounts of dust, they generate giant clouds that obscure the planet's surface. Once the dust is lifted, he noted, the atmosphere warms and can feed the surface-blocking cycle. The MER team would be more concerned than atpresent, Lemmon noted, but early in the storm?s genesis, windy conditions sweptoff light-blocking layers of dust from Spirit and Opportunity. Caused by Martian dust devils and steady wind,the ?cleaning events? doubled the rovers? power to around 800 watt-hours lastweek and boosted hopes of Opportunity?s planned descent into Victoria Crater.As the smallstorm gathered fury, however, Opportunity?s energy-gathering ability hasbeen slashed to a dangerous 280 watt-hours each day--only enough to light one 60-watt bulb for less than 5 hours. ?Theworst-case scenario is that enough dust in the sky decreases solar energy tothe point that we have to shut down too many things to save power,? Lemmonsaid. ?The rovers keep their battery alive by keeping their electronics alive.? John Callas, project manager for the MarsExploration Rover (MER) mission at NASA?s Jet Propulsion Laboratory in Pasadena, Calif., explained that a dead rover battery could allow cold temperature to maim Opportunity?s electronics. ?It?s likeleaving your laptop out in an Antarctic winter,? Callas said. ?Soldered joints inthe electronics can contract due to thermal contraction. If a rover gets toocold, something essential will fail.? Callas explained the situation isunprecedented, so the team isn?t certain how much more light-blocking dust therovers — especially Opportunity — can take. Callas saidthe storm?s growth rate was shocking. ?The rovershave weathered weaker storms in the past, which developed over the course ofweeks, but nothing like this. This thing came out of nowhere,? he said. ?Thedust levels just skyrocketed.? John Wilson, a planetary scientist who studiesMars? atmosphere at the National Oceanic & Atmospheric Administration inPrinceton New Jersey, says the topography of Mars? southern hemisphere isprobably to blame. ?Thesouthern hemisphere, on average, is about 4 km (2.5 miles) higher than the northernhemisphere, which helps dust storm formation go global,? Wilson said,explaining that Earth experiences a similar storm-fueling phenomenon nearIndia. ?Tibet is high in regards to mainland India, and so its height helpsintensify the Indian monsoon,? he said, by generating windier conditions atlower elevations. ?Althoughthe storm threatens the rovers, it?s giving us a great opportunity to trackanother powerful dust storm from start to finish,? Wilson said. 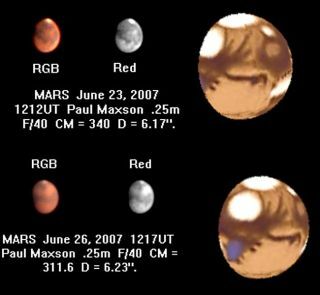 ?We get to seewhere a storm starts and how it grows, then enter that information into a modelto help us predict Martian weather in the future.? Callasnoted that global duststorms spawn about every three Martian years (about six Earth years), andthe last to occur was about two Martian years ago — so the current storm?spotential to become a globalevent is on cue. If it does, Callas and his team will only be able to crosstheir fingers. ?The reality of the situation is that we?relimited as to what we can do from the ground by cutting power use,? Callassaid. ?If itcontinues to worsen and stay that way, it?s a survivability issue for Opportunity. If Mars wants to killthe rovers, it can. ?